Parque Nacional Xuan Thuy se encuentra en una zona de 12.000ha de Giao Thuy Distrito, Nam Dinh. Este parque se encuentra a 160 km de Hanoi, and is the perfect destination for those who want to explore the wild nature of northern Vietnam and its amazing biodiversity. Adicionalmente, the place caters to visitors with a multitude of tourist packages and attractions such as community trips or to cultural sites in the surrounding area. It could be said that Xuan Thuy is one of the best places in the world to see animals in their native habitat, especially birds. 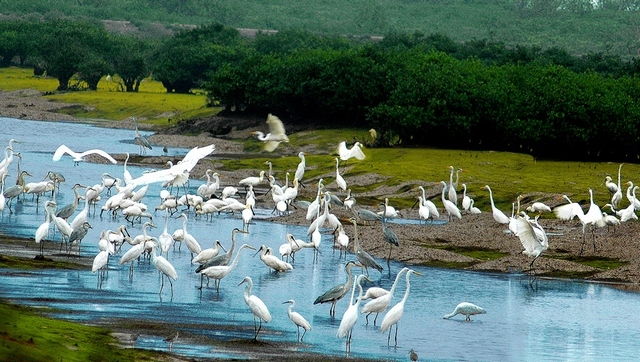 Scientists estimate there are over 100 species of migratory birds which stop within Xuan Thuy to rest during their migration, usually in massive flocks. Besides these migratory birds, there are also 215 species of birds living in its forests and mangrove swamps all year round, including several rare types such as the Pelican, Spoon-bill Stork and Saunder’s Gull. Under the waters of Xuan Thuy is a magical habitat of approximately 500 kinds of sea creatures like the Sea Cat, Sea Fox, and many colorful species of crab, shrimp and fish. Por otra parte, this park contains huge numbers of medicinal and edible plants, including rare kinds of algae and seaweed. The exceptional biodiversity of Xuan Thuy coupled with its pristine landscapes make for breathtaking views; the kind usually only seen through the lens of a nature documentary.